Are we in need of distractions? The political masters obviously think so. There have been hackings, cuttings, slayings and crushing events. As battles continue raging in Syria and northern Iraq, European cities face the next round of urban slayings. As that was taking place, eyes in the western media were taken off brewing troubles among the Gulf States. Eager pots have been calling kettles the most unspeakable things. (Not so much black as crispy charred.) No one would have been surprised by calling out that tenured terrorist state known as Saudi Arabia for its various actions in Yemen and its own vicious brand of fundamentalism advertised globally. Yet it was Saudi Arabia, along with Egypt, the United Arab Emirates, Bahrain, Yemen and Libya insisting that Qatar was the destabilising influence in the region. (The others were naturally innocent of that.) All land, air and sea traffic would be halted with the state, while diplomatic missions would be removed. Qatari citizens would also be given their marching orders, having to leave within 14 days. Disagreements between Doha and Riyadh are far from new. Being eager practitioners of censorship and media control, Riyadh has shown little time for such bold media efforts as Al-Jazeera. Bristling at what it has deemed negative coverage, officials in Riyadh have repeatedly insisted that Qatar be rebuked for backing its own horses in the Islamist struggle, much of this borne by the rumblings of the Arab Spring. The Islamic Brotherhood is top of that list, and what is not surprising by looking at the list of states intent on strangling Qatar is that they have taken a dim view about the populist aspirations of the Muslim Brotherhood. In Egypt, an elected head of state from the organisation was deposed in a coup that re-established the primacy of the military. Qatar’s backing of Mohamed Morsi’s short stint at the helm was well and truly noted. In a measure of placation, Qatar closed down Al Jazeera Mubashir Misr, its twenty-four hour news channel in Cairo. Since then, spats have grown in number. Ambassadors have been sporadically recalled. In September 2002, Saudi Arabia did so over what it regarded as unfavourable coverage of a Saudi plan which entailed normalising ties with Israel in exchange for a peace deal with the Palestinians. 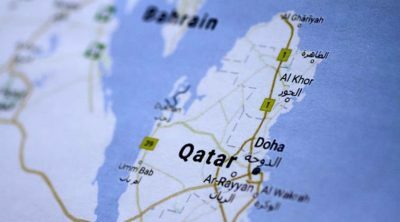 In 2014, the three Gulf States intent on punishing Qatar also withdrew their ambassadors citing the usual grounds of interference in internal affairs and “jeopardizing regional security”. Those concerns have not changed, and the move of severing ties and effectively shutting off Qatar is a measure of how dissatisfied the other state have been towards Doha’s efforts. More recently, Qatar’s efforts to secure the release of a group of falconers, among them members of the royal family, captured by a Teheran-backed Shia group in Iraq, drew attention from Abu Dhabi and Riyadh. The intended ransom could well have run into a billion dollars. The isolating move has triggered obvious consequences. Qatar has become a place of strategic importance for various powers. The US, for one, has its largest airbase in the Middle East located in the state. Nor has the provocative move gone unnoticed by others who have thrown their weight behind Doha. The Turkish parliament has passed legislation drafted in May permitting the deployment of troops to the country’s military base in Qatar. In 2015, Turkey’s ambassador to Doha, Ahmet Demirok, forecast an eventual troop number of 3,000. Then comes that important matter of aviation. 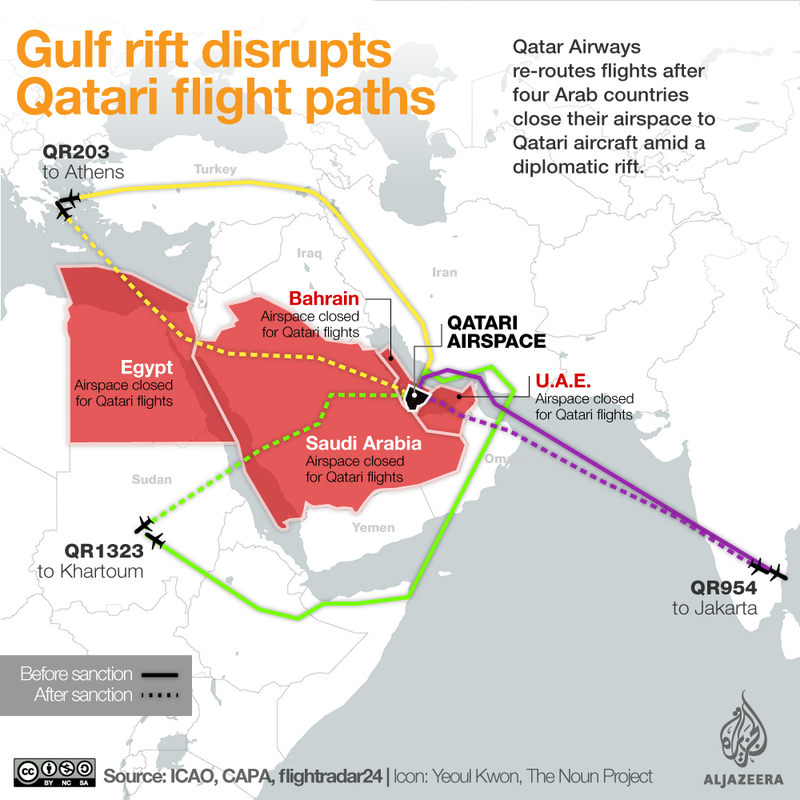 Qatar’s flag carrier, Qatar Airways, has had to re-route flights over Turkey, Iran and Oman, given the forced closure of airspace to their planes. On Tuesday, 70 flights were grounded. Other airline carriers will be delighted by the move, given the relentless rise and appropriation of key routes of travel from Europe to Asia and Australasia by the Middle Eastern carriers. The gesture of isolating Qatar is looking, at best, one of economic self-harm, affecting such carriers as Bahrain’s Gulf Air, Dubai’s Emirates, Saudi Arabia’s Saudia and Abu Dhabi’s Etihad Airways. The demands this time for resolving this monumental tiff are bound to be even steeper than they were in 2014. Sultan Sooud Al-Qassemi makes his own hazard at a set of guesses, and it involves a conventional, authoritarian ploy: muzzle media coverage, entailing the “shuttering of the Al Jazeera TV Network before any mediation can take place” (Newsweek, June 5). That will just be the beginning. The main course will feature the expulsion of Hamas figures and affiliates, along with such undesirables as Islamist writer Yasser Al-Za’atra and Azmi Bishara. For dessert, the Egyptians will wish for a cessation of any pro-Morsi coverage, while the entire collective will push for shackles to be placed on charitable organisations. Such demands are what is conventionally called unwarranted interference in the internal affairs of another state, but the despots of the Gulf are bound to miss that irony. What Qatar is accused of will not only be matched but surpassed. Dr. Binoy Kampmark was a Commonwealth Scholar at Selwyn College, Cambridge and lectures at RMIT University, Melbourne. Email: [email protected].